Hi, I am interested in your 1969 Land Rover Series II listed on Autotrader for $19,900. I'd like to get more information about this vehicle and confirm its availability. This beauty has a ton of upgrades! 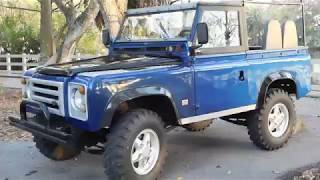 Was purchased in South America from an active member of the International Land Rover Club. Upgraded front end (lights) and bumper for the Defender appearance. Done the right way, looks great! Vehicle runs great, starts right up! Please note this is NOT a restored Land Rover, but rather one which was tastefully upgraded with the goal of being useful and reliable. If you are looking for a great looking vintage Land Rover that is NOT a museum trophy, but rather one to enjoy this is the one! Exterior Paint 8 out of 10. Interior 8 out of 10.